It’s about time I bake some bread, wouldn’t you say? It’s a lazy-dozen days into the Year of Ellen Baking and flour hasn’t yet been sprinkled on the kitchen counter. I rolled out of bed this morning and decided to remedy that. 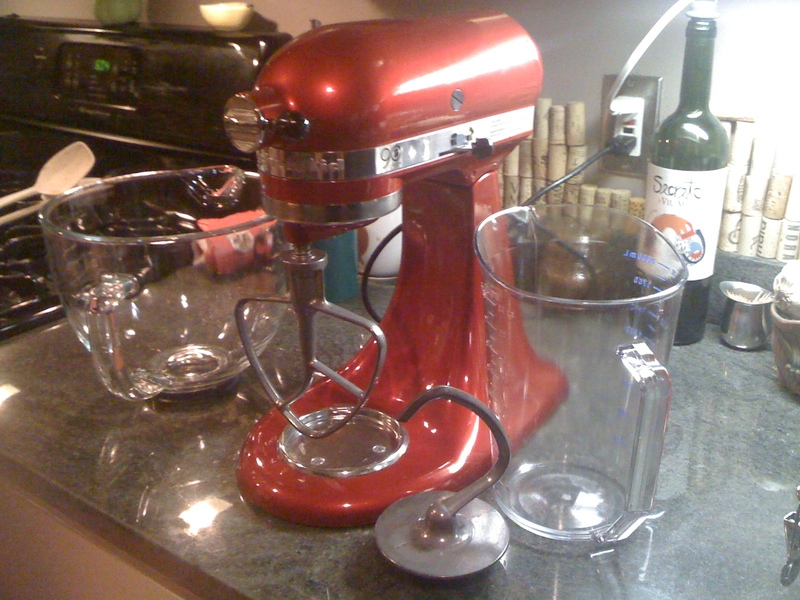 Measuring cups and the mixer were in use within 15 minutes of my alarm going off. It’s not like I have a lot of time to make bread today. The pile of work on my desktop is pretty steep. 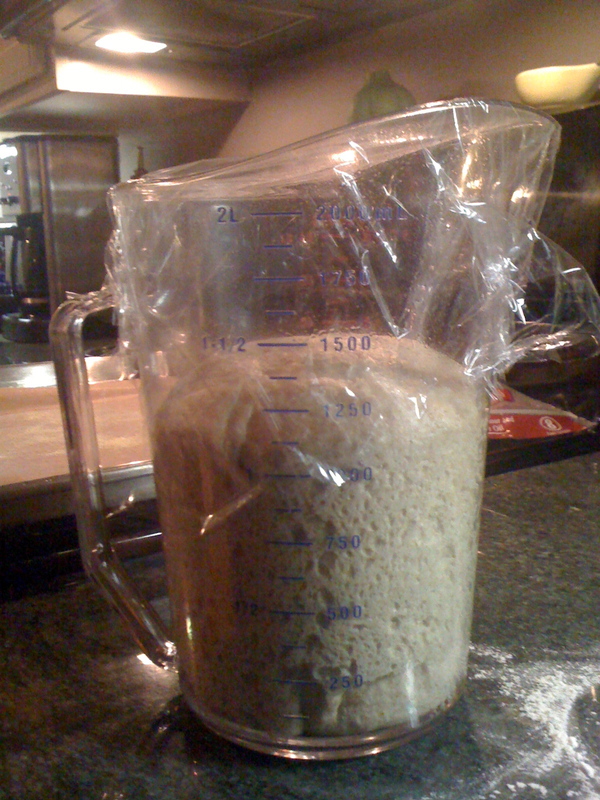 Making a poolish (a dough starter) and then going through the hours of rising and deflating and proofing and on and on – the protocols for my most flavorful breads – just isn’t in the day’s agenda. Luckily, I have a quick, one-rise recipe I keep in my back pocket and pull out when time is tight. I found the recipe at Principia Gastronomica last summer. Easy enough to remember. Easy enough to prepare. Easy enough to adjust. The thing I like about this recipe is that the blogger had suggested to add whatever proportion of flours you wish – all white, half white/half wheat, some spelt – whatever. Just make it 3 cups flour. Baking isn’t known for it’s flexibility; quite the opposite in fact. I like the freedom to try my own thing. I vacillate between a strict 50/50 white-whole wheat ratio and one where I use 1.75 cups of whole wheat (King Arthur Flour’s whole wheat, which is on the fine side of wheat flours). Today’s bread is the latter. 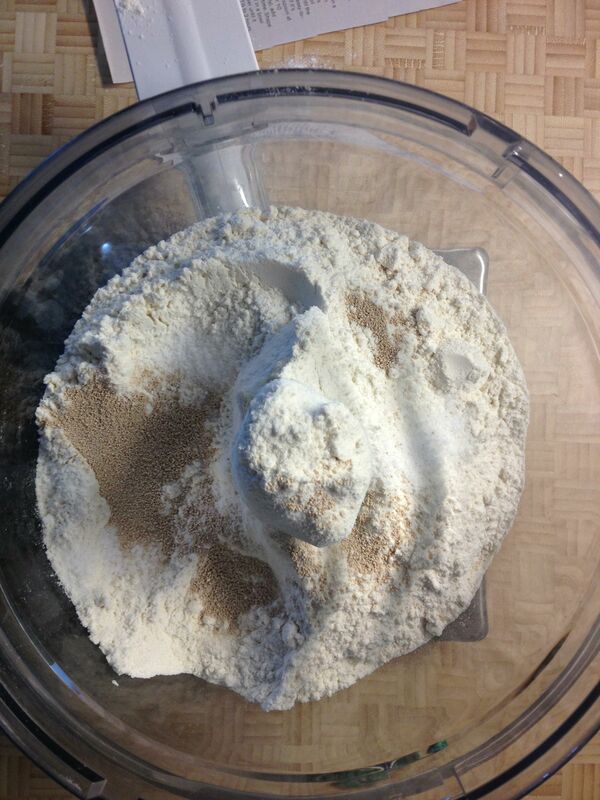 Mix flour(s), yeast, salt in bowl of Kitchen-Aid mixer. Attach a paddle (oiled with Pam or something like that) and secure bowl to mixer. While mixer is on low, add about a cup of warm water. 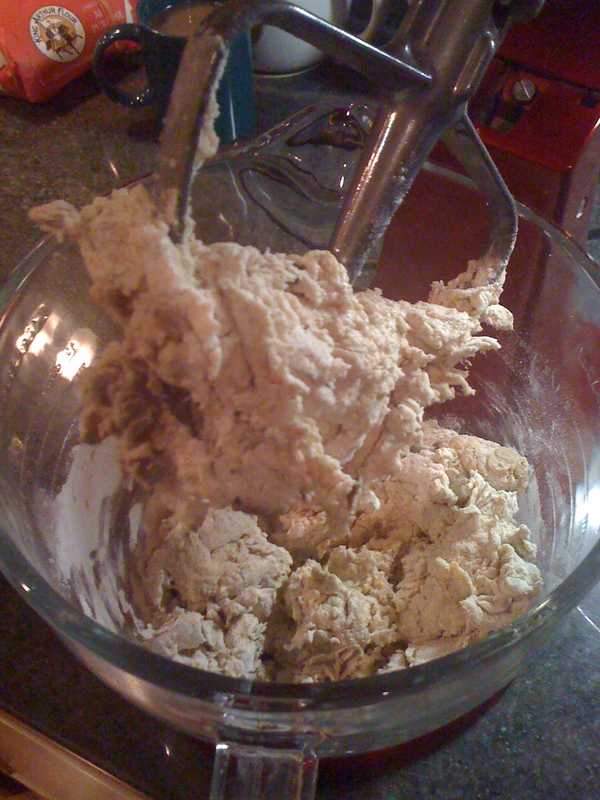 When dough becomes shaggy (less than a minute), stop mixer, take off paddle (clean off dough that sticks and put back in bowl) and attach oiled (with Pam etc) dough hook. Less than a minute after adding warm water to the dry ingredients, the mixture becomes a shaggy mass. Why I oil paddle/hook: Makes it easier to clean dough off paddle, and helps prevent dough from creeping up to top of hook. Alton Brown’s suggestion, not my own genius, unfortunately. With hook now on, turn mixer of medium low. Let the hook and dough do their thing. 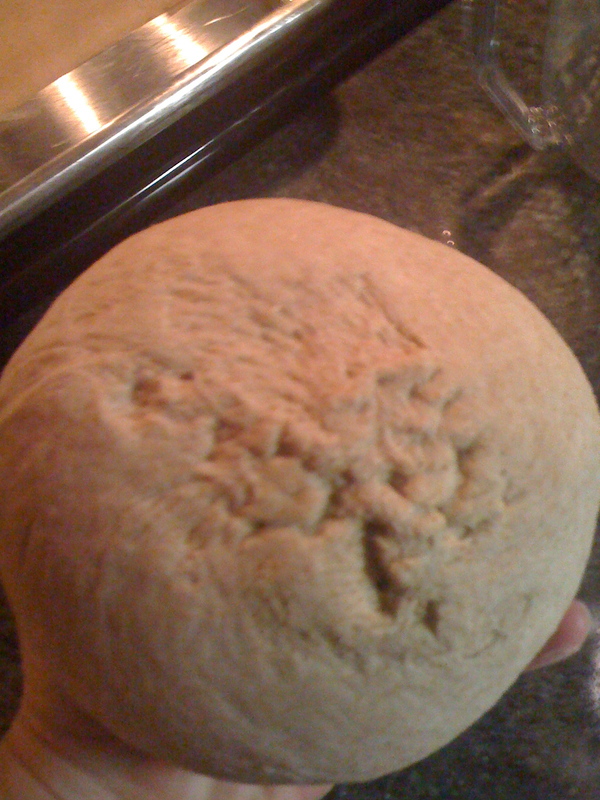 IF the dough is looking a tad dry – if it looks like that dryness would hurt if you were a lump of developing dough – I add squigges of warm water ’til it softens up a bit. 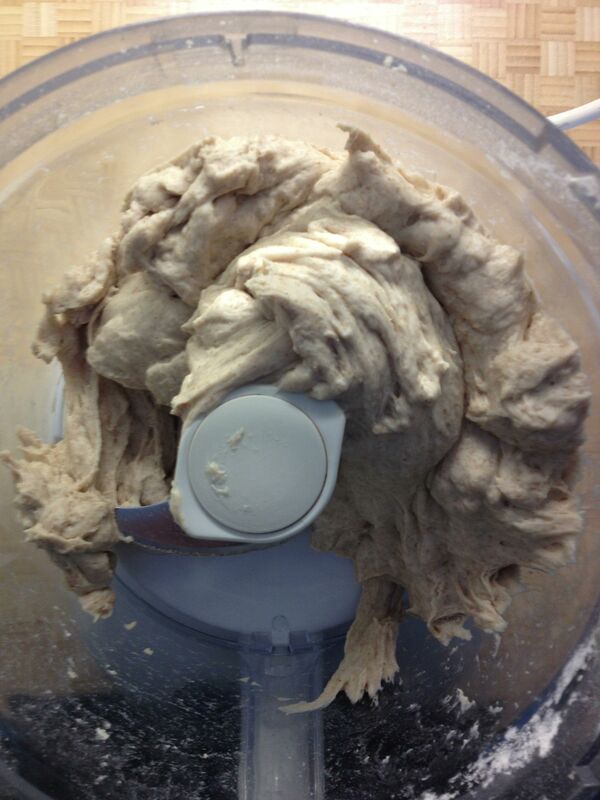 If dough does creep up the hook, stop the mixer and adjust dough downward. 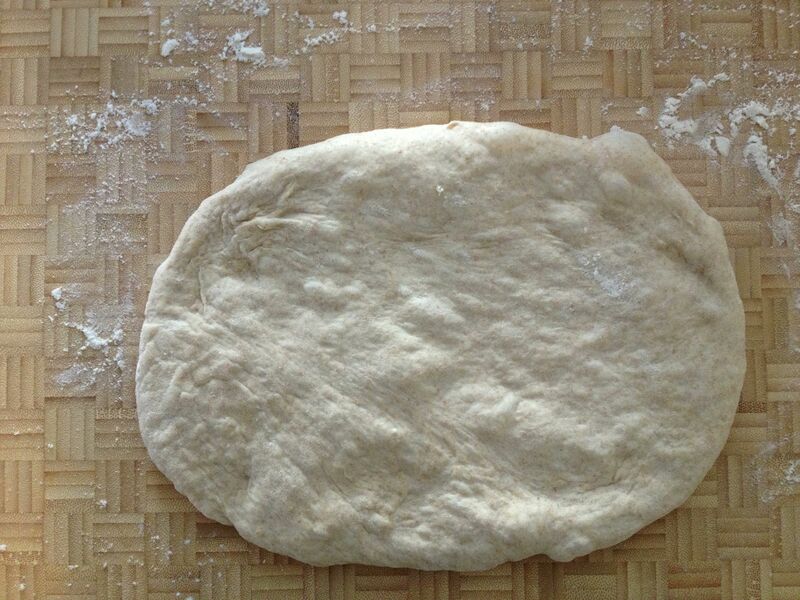 After about 5 minutes, the dough should look like it’s swollen just a tad and look a bit like a soft baby’s bum. At this point, take out the dough and put into an oiled (or Pammed) bowl. I like to put my in a large (2 quart-sized) plastic measurer with markings. 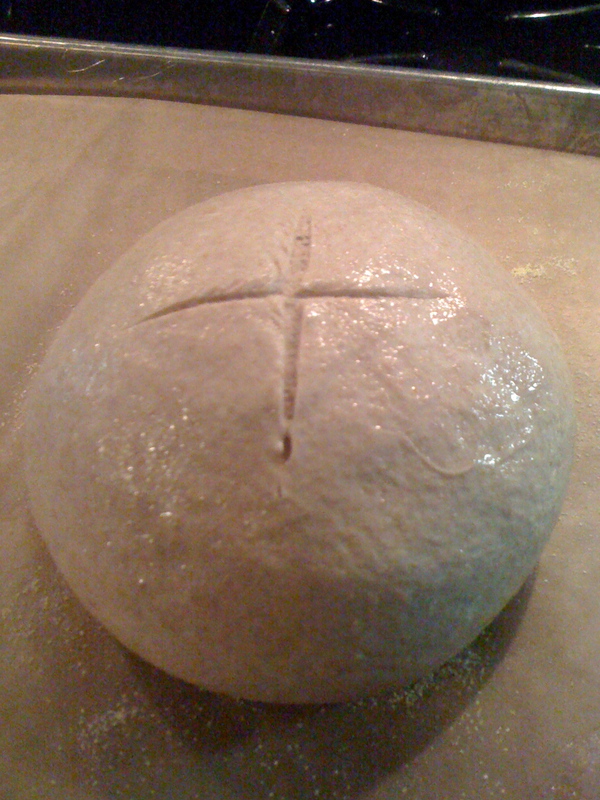 That way you can tell how much the dough has risen. Next, cover the container with plastic wrap. Put in a warm draft-free space. Warm? In January? I’m a frugal gal myself. My house is nowhere above 68F at any time between August and June. How the heck do I find a warm space that’ll make my baby snuggly and happy? Here’s the trick: Boil a cup of water in the microwave. 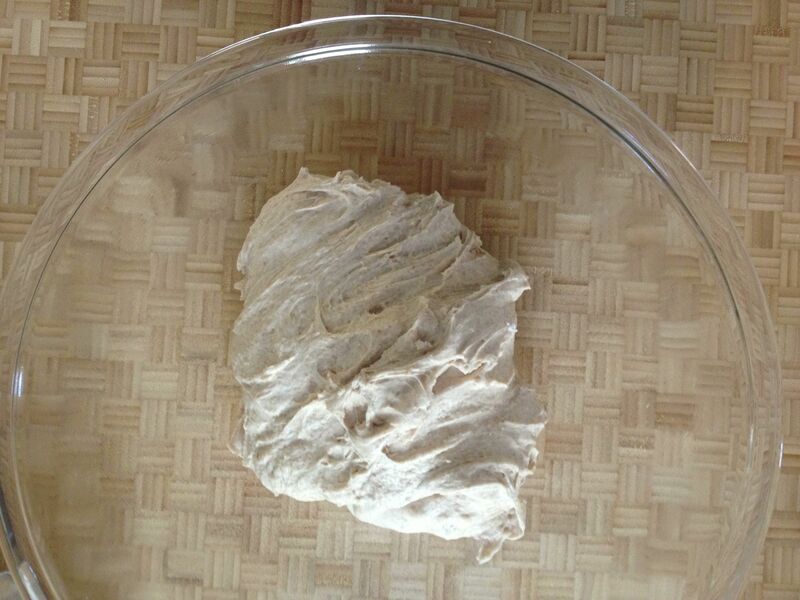 Put the dough bowl in the microwave with the just-boiled water. Close door. You’ll have a warmish space for the next hour or so as the water releases heat as it cools down. 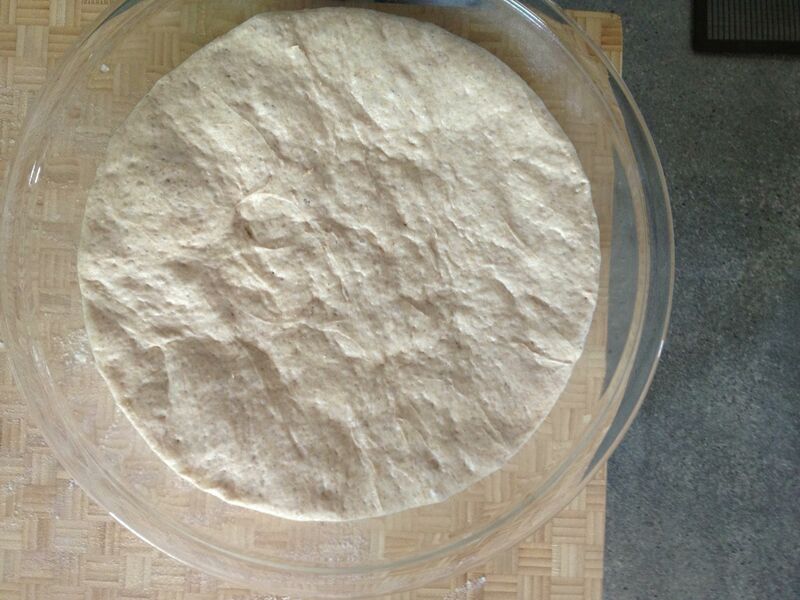 The original recipe says to let the dough rise an hour or so. I take mine a but further – up to two hours. The dough is likely to double in that time. Spill the somewhat-puffy dough onto a lightly floured surface. 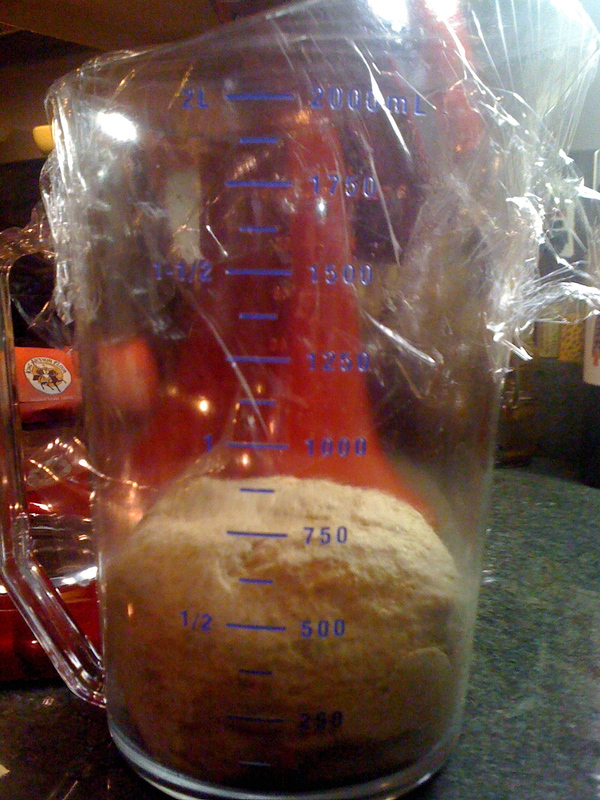 The light pull of your hands on the dough coaxing it out of the container is pretty much enough handling to count toward a light “punch down.” You don’t want to let too much of that air out – this is a one-rise dough, after all. Actually, you can even skip the “lightly floured surface.” Why? This is a dry dough – a quick dip of your fingertips in some flour is more than enough to prevent the dough from sticking to your fingers. And, in this next step you actually want the tackiness of your surface to work in your favor. 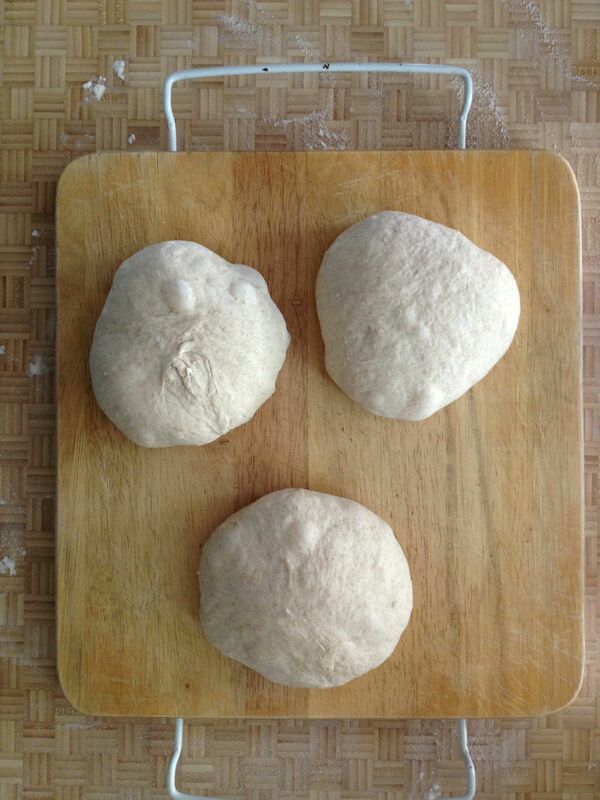 Pull in all sides of the dough into the middle of a round ball. Try your best to pinch them all into one spot. Top should be a smooth rounded surface, and the bottom should look like puckered lips. 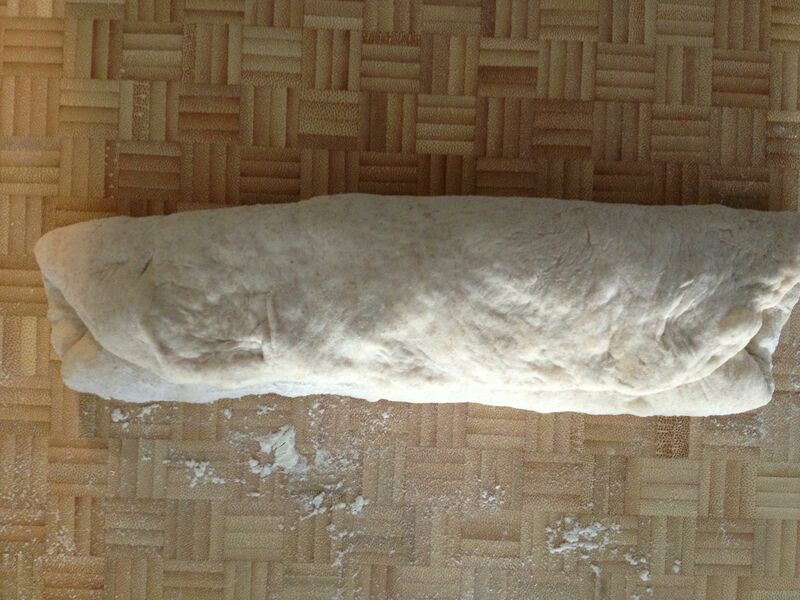 Pull in all the side of the mass of dough into the center and try to pinch together. I admit, I pinched one more time after this photo. Next, put the ball bottom side down. Put both hands on either side of the ball, cupping it from the top, and rotate the ball under your hands – kinda pushing up with your left while pulling down with your right. The tackiness of a flourless work surface pulls the dough taut. And, it helps in drawing in those “puckered lips” and sealing it closed as best as possible. Do the push-me, pull-you thing about 10-20 times. When the “skin” of the ball starts to pull very very tight, STOP! 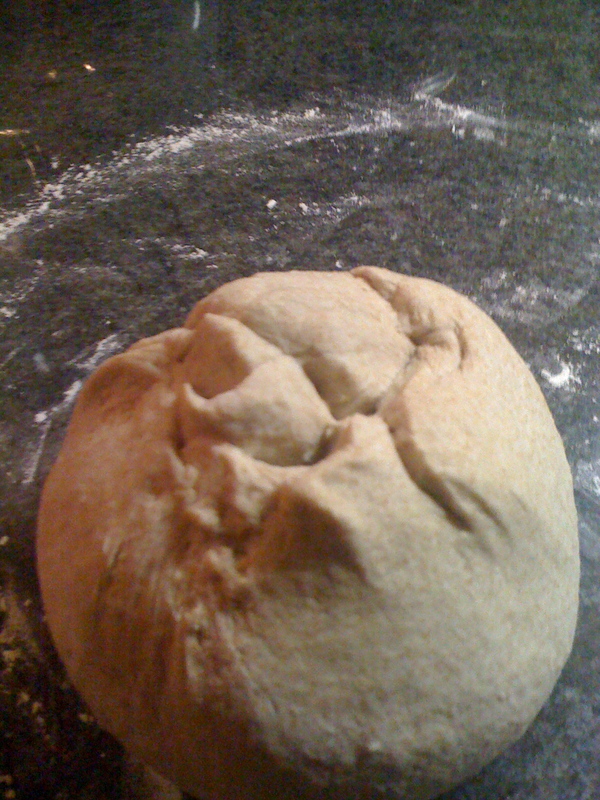 Pushing/pulling the dough in a clockwise direction seals the dough together on its bottom. Pretty cool! Put the dough ball on a sheet pan lined with parchment paper that has been lightly sprinkled with corn meal. Cover with that plastic wrap you used previously (waste not, want not, right?). Let it sit while the oven warms up to about 420F (recipe says 425F but my oven runs a bit hot). In fact, I’ll let it sit for up to 1/2 hour. 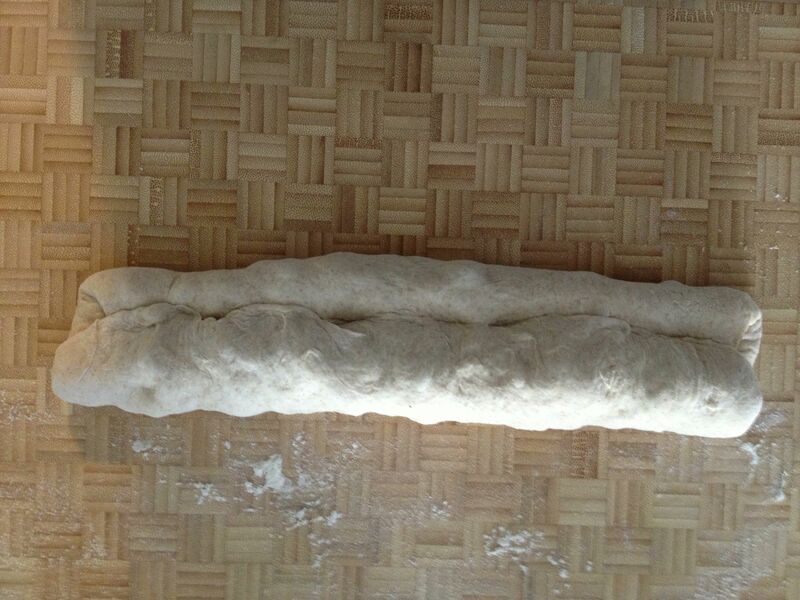 The dough sits for up to a half hour before heading into the oven. Five minutes before you’re ready to put the dough into the oven, throw in some ice cubes. This creates steam, and a humid, steamy oven helps create a nice crunchy crust. Right before inserting the dough into the oven do these two things: 1) slash the top of the dough lightly with a quick movement. 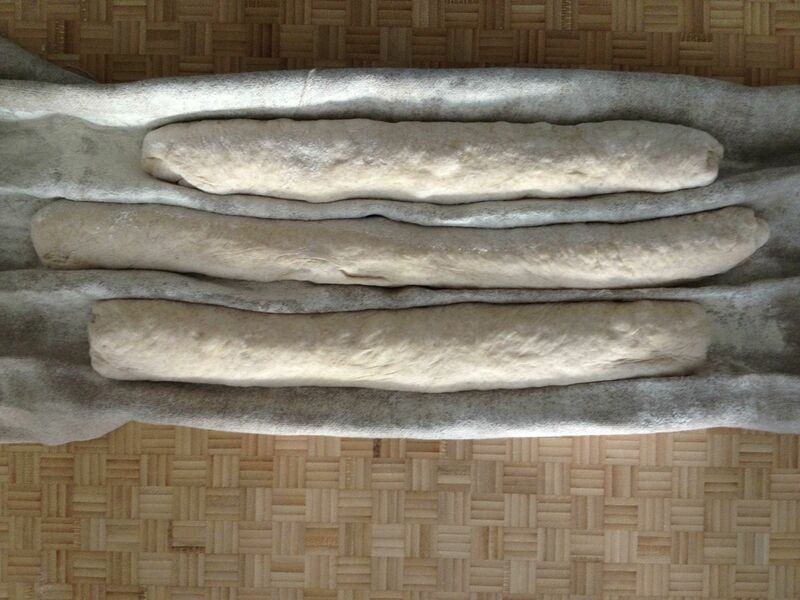 This slashing will help prevent the crust from breaking haphazardly elsewhere as the dough expands. 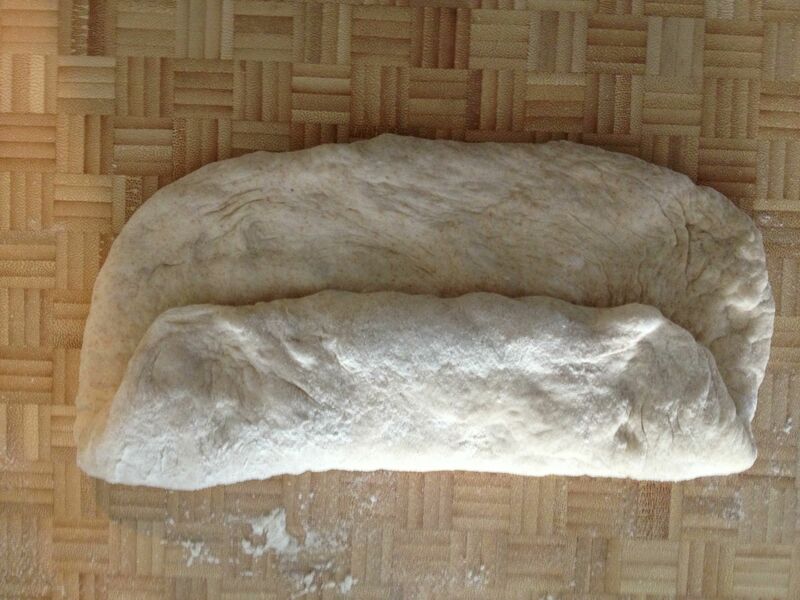 The dough is gonna split regardless – pre-slashing is like a controlled split. 2) Spritz the loaf 4-5 times with a water spritzer-thingy. Again, this helps create a crunchy crust. But I don’t go crazy trying to control the crust, not like I would if I were making French bread or a sourdough. This is a quick-and-easy bread recipe – the crust is what it is. I’m good with that. The recipe calls for the bread to bake about 40 minutes. Because my oven runs a bit hot, I take it to 35 minutes and then check its status. Check for doneness by thumping your thumb against the bottom of the loaf. If it sounds hollow, it’s time to set it free from the oven. What’s a hollow loaf of bread sound like? Good question. And I suggest you take a loaf out at 30 minutes, give it a good thump, and remember what that sounds like, and then keep comparing thumps every couple of minutes. 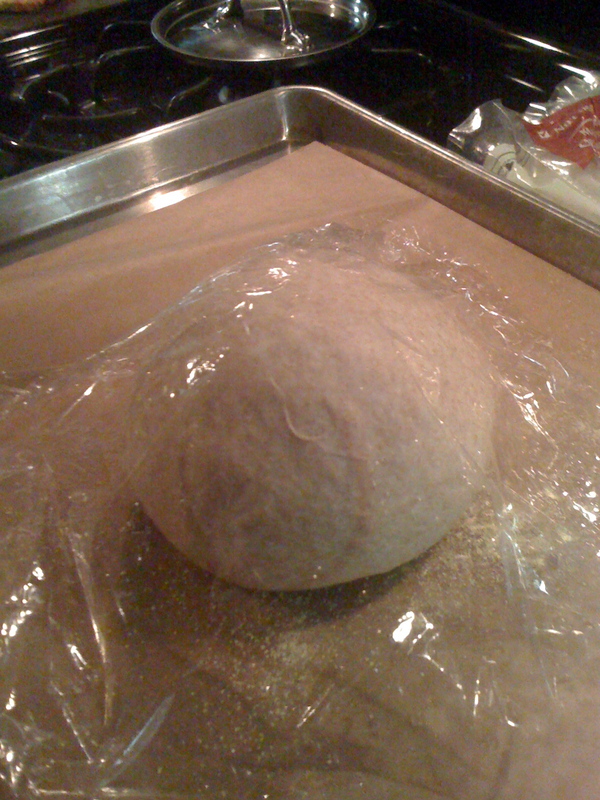 Eventually the bread will be done and you’ll note the difference in sound. Well, that’s how I did it, anyway. Let it sit on a cooling rack for a while so it can finish cooking completely inside. If you can keep your hands off it, that is. 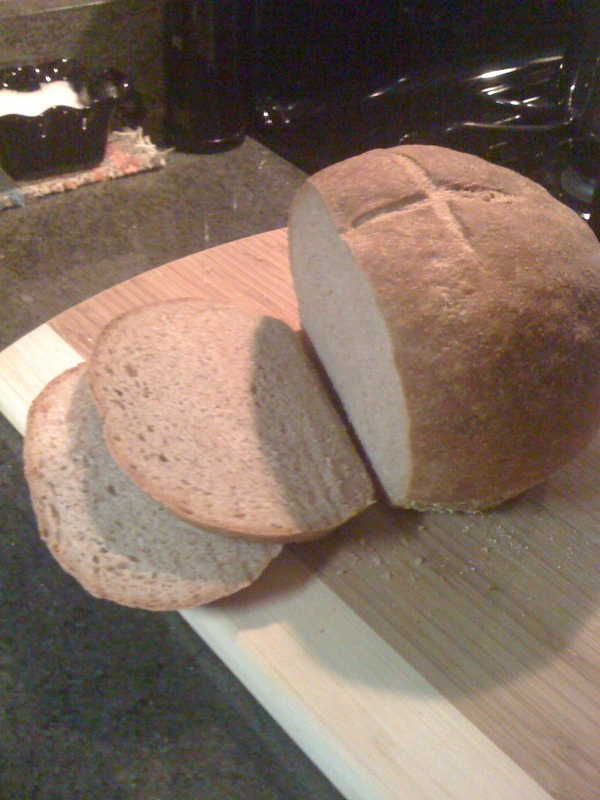 Using this recipe, I made a loaf of half-whole wheat bread 5.5 inches wide and weighing approximately 1 lb. 6.5 oz. in less than 4 hours. Fresh. Bread. Fast. Yum. 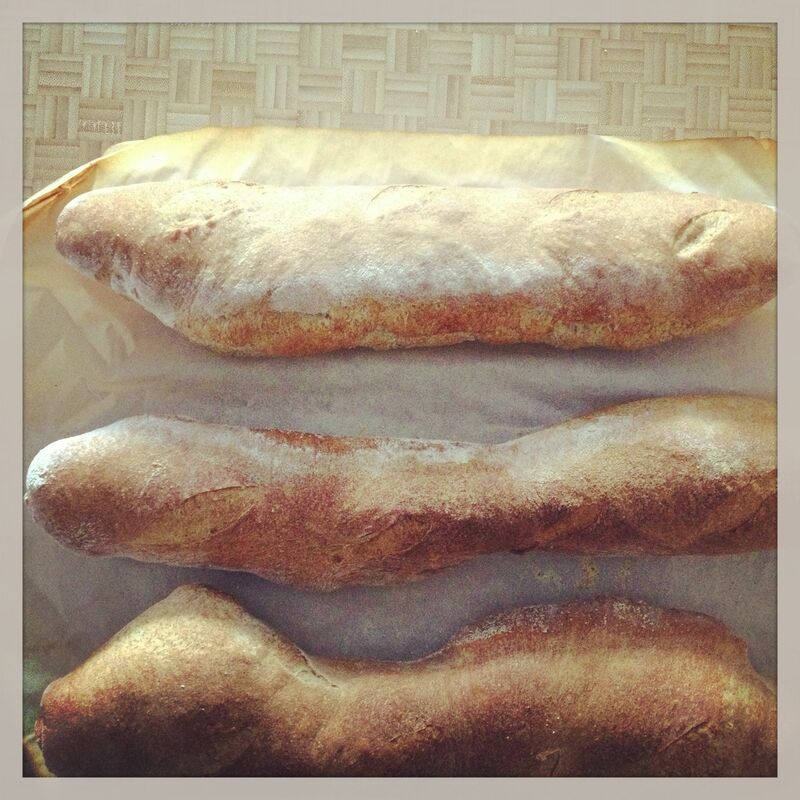 From flour to bread in under four hours - ya! And with minimal hands-on work, too. You are currently browsing entries tagged with whole wheat at The Dainty Dot.